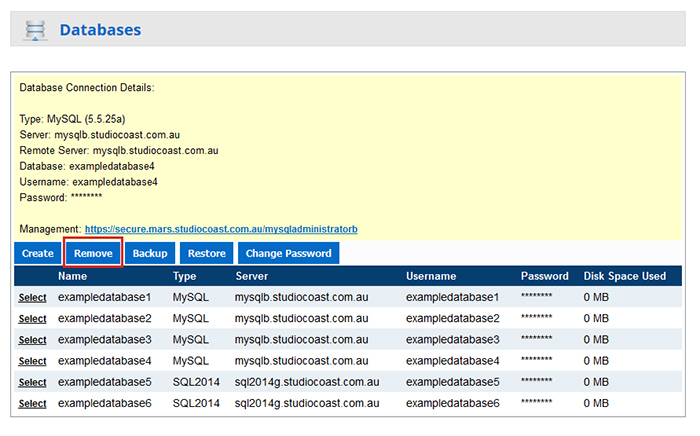 First, log into hostControl and select the "Databases" menu item from the General section. Find the database you wish to remove and choose the "Select" button to the left of it. This will bring up the database's information as well as give you some button options down the very bottom. Select the "Remove" button. This is an important step which lets you confirm that you wish to delete the database. You need to type 'delete' into the box and then click Confirm. Your database should now be successfully removed.